You might be able to breathe a sigh of relief if you hired the right Florida divorce attorney to help you with the end of your marriage, but the handing down of the final decree is often not the last step involved in managing your divorce issues. There are several steps you need to take in your personal life as well and you may still need to consult with your Florida divorce attorney for an array of modification issues. The orders in the decree as handed down may not make sense over time if a person’s situation has changed. For example, perhaps there are pertinent reasons why the judge should reconsider a child support order. If the party paying child support loses his or her job, this individual may be eligible to get child support arrangements modified as well. Substantial changes must have occurred in order to warrant modification. As you can see, these post modification issues can present legal challenges but having a relationship formed already with a Florida divorce lawyer can help minimize the impacts you experience. There are several important things you can do to make sure that you understand everything that has happened and to raise questions with your divorce attorney, if necessary. You might have already read this final document a couple of times, but make sure that you walk through it with your attorney as well. This is important to identify whether or not there are any mistakes and so that you understand the content inside. As you review the decree, outline a list of things that you are required to do as a result of the order and deadlines for completing them. This will help you stay on track if you have responsibilities outlined in the decree. Keep your eyes open as well for mistakes that may be listed in your final divorce decree. Items that are unenforceable because of incorrect details or typos need to be corrected as soon as possible. 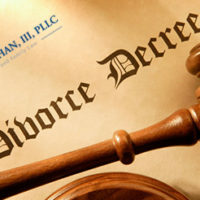 Make a list of these and raise these concerns with your Florida divorce attorney. It can be very challenging to change substantial portions of your divorce decree particularly if your ex does not agree with the changes. There are certain situations, however, where it makes sense to modify the divorce decree. If you were threatened or forced when you agreed to something in the decree, for example, like spousal support or child custody, your lawyer may be able to file a new hearing request motion. Am I Ever Eligible to Appeal My Case? There are situations where you could appeal your final divorce decree if there was a legal error made during the official divorce action. Appeals are quite rare. Courts rarely grant appeals in a divorce case because it is presumed that the family court or divorce judge who has a great deal of experience and expertise in divorce matters got things right the first time around. You must be able to identify a particular legal mistake that occurred during the initial divorce action. In the event that your case does go on to appeal, the higher court is only responsible for identifying whether legal errors were made. This is not an opportunity, for example, to introduce new evidence. If the appeals court believes that a mistake was made, the case could be returned to the original divorce court with instructions about how the mistake should be corrected or the appeals court could deny the appeal, meaning that the original order stands. Whether or not you’ve gone through the appeals process, the final divorce order should be something that you comply with. This is also a good opportunity to update all of your personal legal documents. Some of the most important involve those with beneficiary designations such as your retirement accounts, your brokerage accounts and your life insurance accounts. Talk to your Florida divorce attorney when you have questions about modification.